Lelystad Airport will gladly offer a wide range of programs, tailoring it into the size that fits your company best. Versatile programs may include a presentation, tour, museum visit and catering. And of course a sightseeing flight can be included. 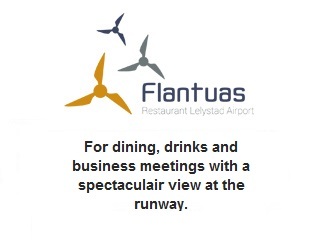 The programs will start in the reception room of the modern terminal building, offering a splendid view on the airport. Lelystad Airport also houses the unique Aviodrome, Holland’s aviation theme-park. Upon your request, we will propose a complete tailor-made program. This is not necessarily limited to the airport, but may include elements outside, such as a car driving test with Prodrive Training, opposite the airport. A visit to Nature park Lelystad or Batavia Stad outlet center and historic shipyard will emphasize the wide range of Lelystad’s possibilities. Information: Pauline Beumer +31 320 284770.